One week ago today, the first trailer for the all-new, 100% estrogenic Ghostbusters proved to the world that a comedy doesn’t need to be funny. More importantly, it proved that I could milk (ahem) a few hundred words out of a dopey movie trailer. So here’s another one! I’m vaguely familiar with the comic-book storyline this movie is based on. It came out about 10 years ago, and it was a thinly veiled metaphor for the War on Terror. (Keep in mind, this was before Obama swooped in and put the bad guys on the run. Whatever happened to terrorism, anyway?) In the story, a team of super-heroes tried to stop a super-villain who was terrorizing a small town somewhere, and he basically turned himself into a suicide bomb and wiped out the entire town. As a result, the U.S. government blamed the heroes and called for the regulation of all super-powered individuals. This put Iron Man and Captain America at odds. Ol’ Shellhead was pro-regulation, and Cap was against it. A lot of the other super-heroes (whose comics didn’t sell as well) were pretty evenly split, and the two sides squared off. Then they fought each other with their super-powers and whatnot, because that’s what they’re supposed to do. I don’t know how it was resolved, but Cap and Iron Man were working together again in the comics the last time I checked, so I guess it turned out alright. It always does. The particulars have changed in the movie, but it looks like the same idea. Tony’s all like, “I believe in liberty, but there have to be limits! We need some common-sense hero control!” And Steve’s totally like, “If super-powers are outlawed, only outlaws will have super-powers!” And then they fight. Now Stark’s just a puppet for the jackbooted thugs who want to control them all. That shrapnel didn’t go into his heart, but clearly it did something to his spine. We also get our first look at the new Spider-Man. 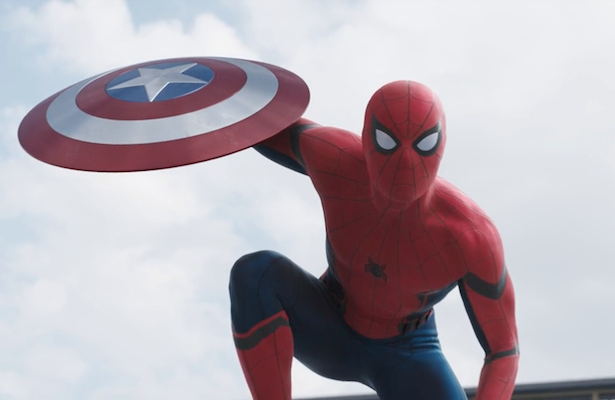 Or, as I’m calling him since he’s a #TeamIronMan fascist: Die Spinne-Mann. Stark calls him “Underoos.” I used to wear Spider-Man underoos up until a few months ago, and it’s good to know what Robert Downey Jr. did too. There’s no way the filmmakers could’ve known how timely this movie would be, considering what’s going on right now in the Republican Party. Brother vs. brother. Pragmatism vs. principles. Iron Man says #MakeAvengersGreatAgain, and Cap says #NeverThunderboltRoss. Bring it on, Trumpkins. I could do this all day.